Are you doing a lot of promotional events and presentations? You need something to help you work more smoothly? A folder would be the first choice for you now. Folders are the perfect option to package information for you clients in a professional and attractive manner. They allow you to easily organize documents and keep your business running smoothly. Printed by WA PRINTING, WA, these folders are an ideal way to store relevant information in the same area and distribute it to your customers. There are several finishes and designs to choose from, you can choose a simple graphic or a logo with bright colors to create a long lasting impression. 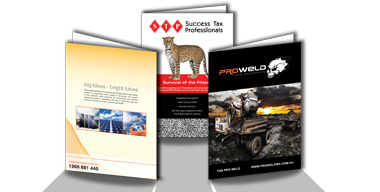 Please contact WA PRINTING for all your requirements of presentation folders. Folders at newly opened store in Midland and in Perth are at affordable rates; reach our excellent service line for today!